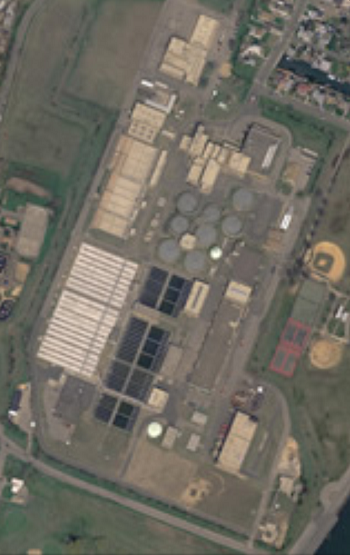 The Town of Hempstead has announced that starting immediately recycling plastics is no longer a game of sorting. No more numbers in the recycle triangle needed. No more figuring out if what you have can be recycled. The town announced they will take all plastics including toys, straws, medicine bottles, playground equipment… Whatever you have. 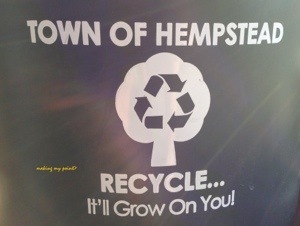 Hempstead Town acts more environmentally-friendly, and will save big money on all recycled plastics. It costs the town $68 a ton to dispose of these materials in the traditional fashion, while recycling these additional plastic items will only cost $10, saving the town $58 a ton, and saving on landfill space. A win-win for town residents. It’s all … in.. your recycle bin. This is been a pet peeve of mine for years. For so many products, the number inside their recycle logo are a number 5 plastic (dairy-yogurt, cream cheese etc) and number 6 plastic(fruit, vegetables etc) and those previously were not recycled. I’m happy to see that we have finally reached the day and age where this can be taken care of. Look I just washed my first number six and threw it in the bin. 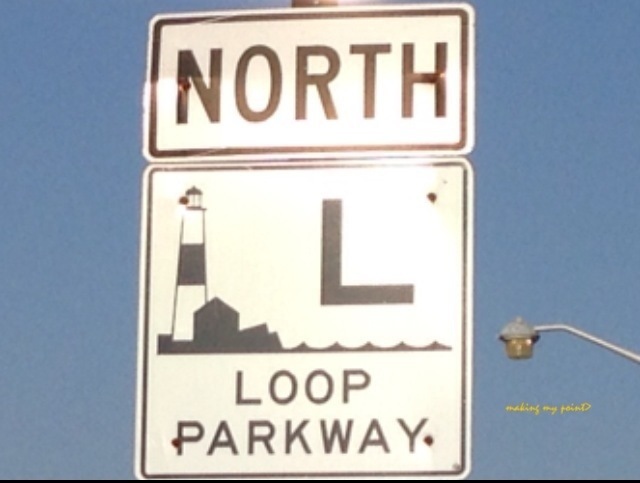 It seems this morning on the Loop Parkway as drivers came up to the drawbridge, the lights changed, yellow to red, drivers slowed their cars and stopped as the gates lowered down. As traffic slowed, like thunder out of the blue, up throttled a motorcyclist either unaware of, or trying to race the red lights and the gate’s descent. He decided he was going to drive in between the cars that were stopping (you know annoying him going slow and all) and keep going over the bridge. He hit himself at least one car, breaking off their rear view mirror, luckily not killing himself in the process. And then, they say he seemed to try to take off! He soon realized he couldn’t get by the bridge. Not bad enough, he came back to bully the driver whose car he hit, a woman by herself. He said that she and the other driver squeezed together and didn’t let him through between their 2 lanes. You know, his god-given right! Another driver there stood up for that woman, they reminded him who hit who and made the guy give his victim his information etc. I say Thank you for speaking up! How you like that one? 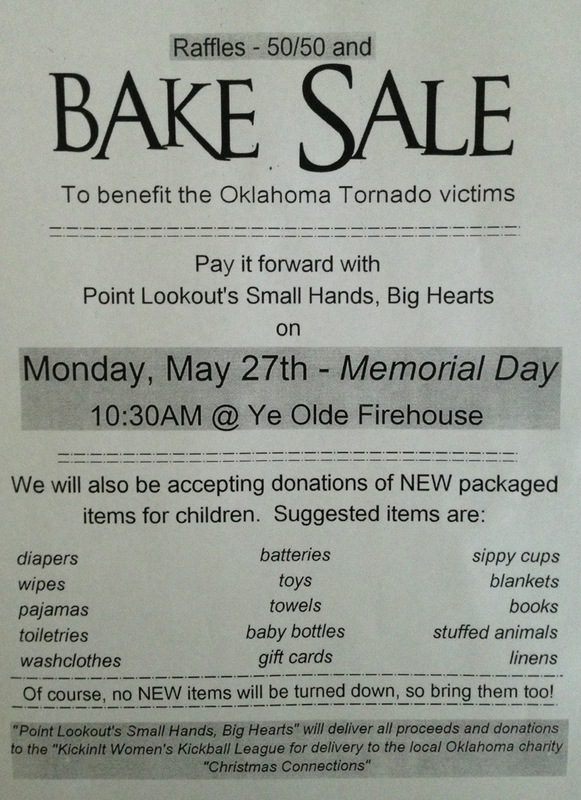 First and foremost: before you think otherwise, I think we should help the people in Oklahoma who were devastated by the eF-5 tornado. By we, I mean as in We The People: we, through The US government. Whatever everyone does in addition is welcome and applauded. It didn’t take long before so many of our local heroes, who are helping Sandy victims most, got right on top of this. I guess we know what it’s like. There’s no question, Sandy has made some real leaders emerge throughout the community. And there’s alot of people with recent hard-learned, self -taught training in “how to get things done” in a crisis. Ive been beside myself all week on this issue and how to approach it. Truth is it’s why I’ve been unable to publish anything- I’ve been fighting myself all week on this. i have widely mixed feelings. people pointed out that we are rushing to help the people who voted against Sandy relief. Others pointed out we are helping the people, not the politicians. I agree… To a point. I was happy this week to see some memes about the fact that Oklahoma’s Senator Coburn, whose healthcare plan was to pay doctors in chickens, thinks they should get federal aid (I believe they call that “takers”!) AND if that hypocrisy wasn’t bad enough, he thinks that aid should be paid for by cutting other expenditures… Like Sandy aid! Last month I kept quiet when some of the most vocal and steadfast opponents to the Sandy Relief Bill, who held it up for over two months, and in the end were a considerable block of votes against it, were rushing to demand Federal aid (week of April 30) for their own, natural man made disaster at the West, Texas Fertilizer Plant explosion. This went completely unnoticed because we were in the middle of the Boston bombings. Aid for me, not for thee is what they say? makes my blood boil. My anger at a few politicians doesn’t override what I and most New Yorkers would do, put in a one on one with the victims: help. So I just.. let it go. Lets argue about it later. Right now there’s work to be done, and good people doing it. 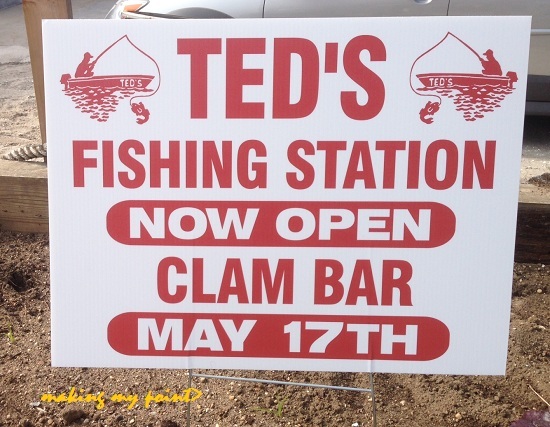 I was glad when I got word midweek last week that Teds Fishing Station was about to reopen. Ted’s is an interesting place where people of all generations can share a summers day (or evening) and do different things, even together. While there, at any given time, you see people get in and out of boats, enjoy lunch, kids play in the sand, dogs share lunch dropped in the sand, people partake of a beer at the bar.. something for everyone. We all know how hard Superstorm Sandy really hurt everybody on the bay here in Point Lookout. Maybe no one more than Owner Ted Wondsel, his long face, and his destroyed dream, Ted’s Fishing Station in the background, in this iconic picture from right after the storm (click here for photo), amongst others picked up by CBS news and The Chicago Trubune. Well they’re back and better than ever, but I found out, it might not have been so. “My nephew Sean came down from Toronto after the storm. He was heartbroken and my husband was really heartbroken, too. This isnt our livelihood, this is Teds dream come true. 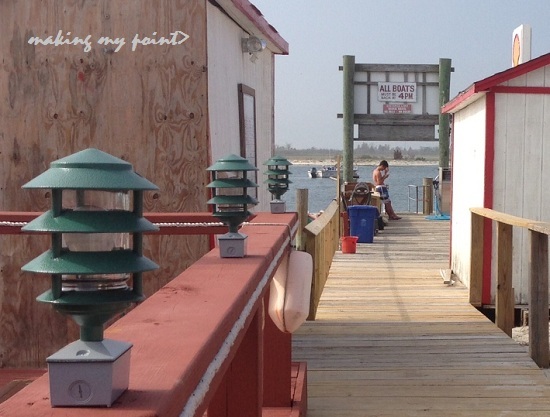 He started at Scottys (Fishing Station a few doors down) as a dock boy when he was a kid”. 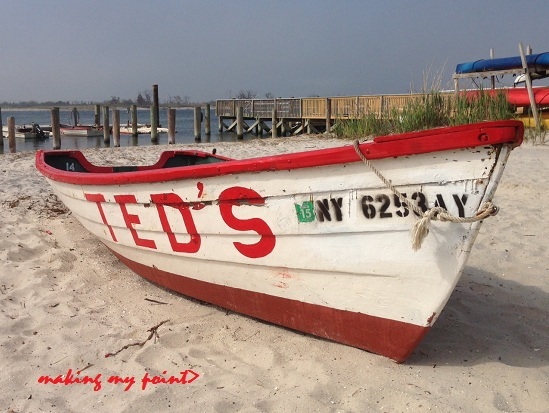 When Ed’s fishing station came available, adding big red “T”‘s to the front on “Ed’s” boats was a no brainer and Ted took the leap. Pretty much everything – all the docks, all the boats, all the structures, all the motors; everything had been inundated and either washed away, destroyed or left behind in ruins. The sun sets on the skiffs and kayaks at Ted’s Fishing Station. Needless to say, when he saw that, Ted was touched nearly to tears. 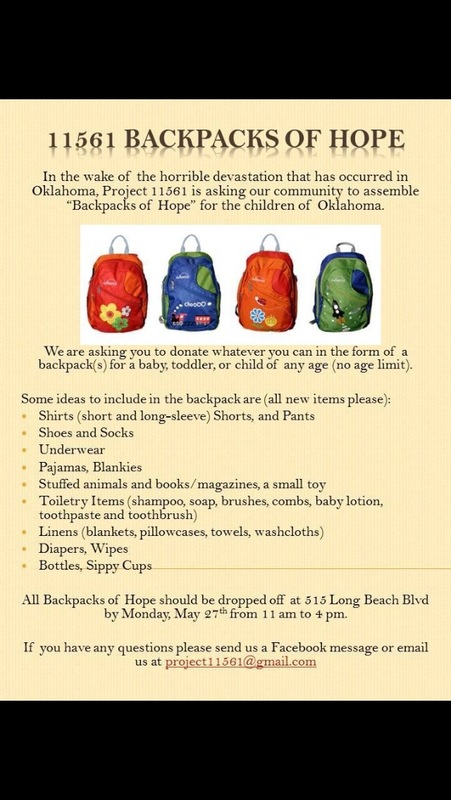 Word spread about the needs Ted’s and many others faced. Help started to come in surprising ways. A Point Lookout resident picked up the freshly salt-water inundated motors in his own truck and dropped them in his pool to soak the salt water out, which saved a number of them. Next to her is retired teacher and resident bartender Karen, Sue says “she has been here almost every day helping us since”. 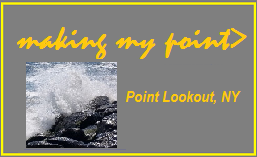 Hope floats… And I sure hope you didn’t own anything in it’s path! The big red bar is a 12 x 12 piling from the 60s. For years it’s been a landmark there. The kids love sitting there – perfect kid height. Like everything else, even though incredibly heavy, it was lifted and floated away during Sandy’s storm surge. Sue says over the winter “I went over to K&K Outboard (across from Texas Car Wash in Island Park) to buy parts and motors”. She casually talked to them about their big red bar, joking maybe they could find it on google earth. The next day she received a call from them. They told her they “didn’t want to say anything while you were here, because our dock builder claimed it, but it’s here for you! 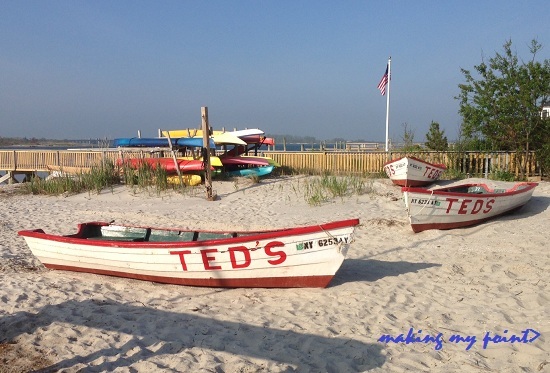 Ted’s Red Bar sits at K&K marine in Island Park / Oceanside where Superstorm Sandy left it. Photo by and courtesy of Sue Wondsel. “He couldn’t believe they actually had it – it had to go through the bridges and over the marshes to get there. A friend of ours who’s a mover took their truck and brought it back for us”. The Big Red Bar is back in its original location now. 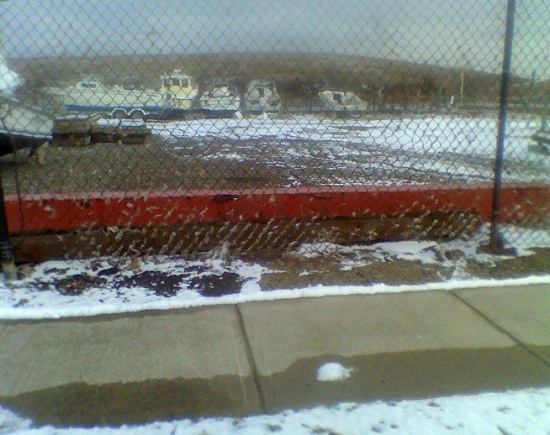 The huge Piece of wood that floated away in Superstorm Sandy, was located in Island Park and returned to it’s rightful place. 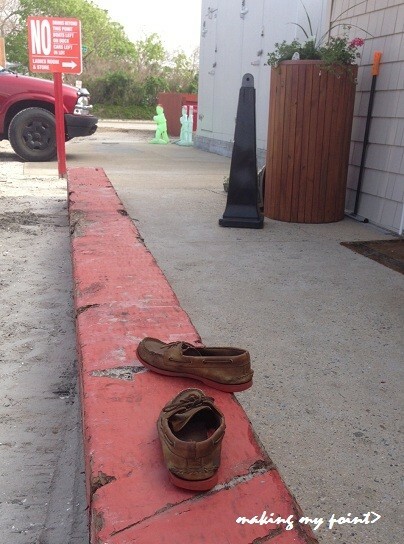 A woman from out of town even returned a Ted’s life jacket which was found at Jones Beach. It’s become tradition at Teds Clam Bar for patrons to have their own shell, where their money resides at the bar. Some are just plain, some are ornate, some are huge, clam, oyster,whelk, … lobster claw; some are not even shells. All were numbered. All are gone. Since my visit there Karen did post on Ted’s Facebook page that some shells are in. .
My highly personalized shell is in the works. Too bad – the shell that went down from last year was really something special, thanks to my wife! Thankfully, they have been able to spend the off season on a full fledged rebuild. Many generations of family members and friends came down to help clean up, reorganize and rebuild. The decks and docks are (most) all back on and in the water. The new bait shop looks like an inviting seaside curio shop, one that also sells lots of funky decorations for fish hooks. I hear the fish just flip for them (ba-dum-Bum-cha). Bait, Tackle, and all good things…. Al who works there and lives just a few doors away on the water, dealt with all the flooding, clean up and rebuilding at his house too, and has also lent a hand on the rebuild. “I like the way it looks. It’s so much more open and inviting than it was before”. The layout he explains is easier for him to get goods in and out. I think he’s also saying it looks a little more “non-fisherman” friendly. “Its a lot nicer than it was. I don’t even have tile in my home” Sue jokes. Sue also points out to me that Teds prize shark adorns the wall now for the first time from their own house. “If it wasnt financially for people helping out, and just coming down to help us…” She drifts off, but we all know what she means…. 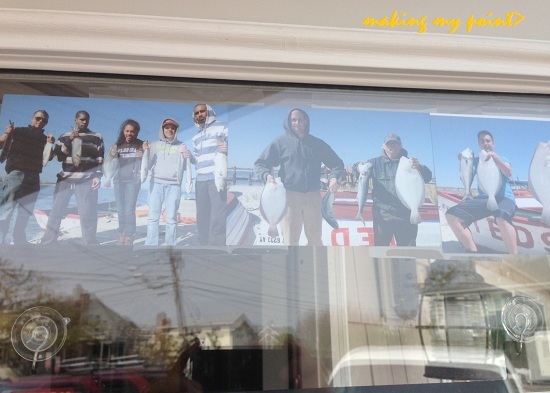 The boats are back in the water and Sue says the fishing has been good, as pictures up on the front door attest. Photos already up of anglers retruning with their catch! 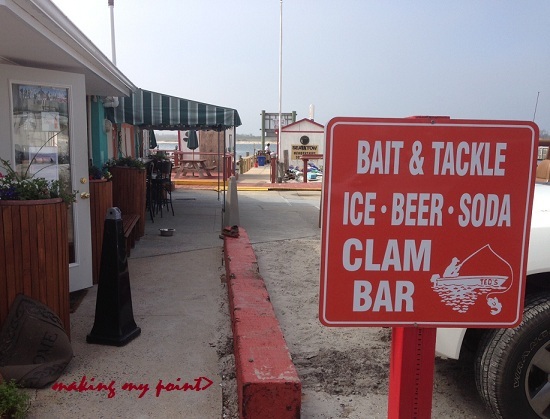 The clam bar is open once again, saw many of you there on opening night. 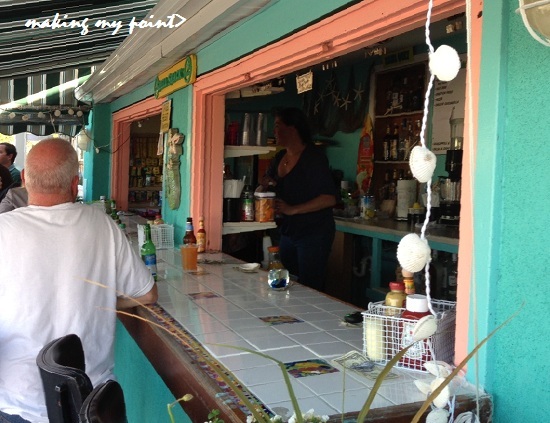 Did I ever tell you I had the best shrimp cocktail of my life there last summer….? The newly redone bar was open friday evening May 17, 2013 for their “Soft Opening”. Welcome back, just in time for Memorial Day weekend… why not come on down, see the sign, the new place and say hi. Did You See the Stars on (west) Broadway? Stars Of Hope on West Broadway. Love the “We are United” one! had to go to the West End of LB today. Its been a while. I drove up Pennsylvania Ave, it’s just one house after another thats destroyed, all bear the the “Until Everyone Comes Home” signs. it was pretty depressing. this is so far from over for all these people. 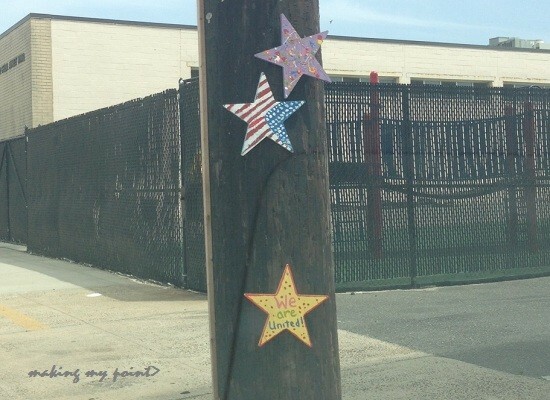 on my way leaving, I noticed the stars of hope that have been put up around town. dozens, more. Oceanview, Beech, West Broadway. seriously-they’re everywhere, and adorable. they really did bring a smile and a sense of hope. good work to those who made them and put them up! thanks Stars of Hope NJ-NY and Project 11561 and all involved.